When Ram says Heavy Duty they mean it. The 2019 HD delivers impressive power and handling thanks to Ram's innovative engineering. Read on to learn why the Ram Heavy Duty is the most capable pickup truck. The 2019 Ram Heavy Duty offers a new 6.7-liter High Output Cummins Turbo Diesel I6 engine. The turbo diesel engine delivers an all impressive 1,000 lb-ft of torque and 400 horsepower. Weighing in more than 60 pounds lighter than previous-generations the new engine offers more power and torque. The second Cummins Turbo Diesel engine received a performance boost with 370 horsepower and 850 lb-ft of torque. The standard 6.4-liter HEMI V8 engine also saw upgrades this year to deliver 410 horsepower and 429 lb-ft of torque. Each engine comes equipped with a different transmission to guarantee the best handling. The 1,000 lb-ft high output Cummins 6.7-liter Turbo Diesel engine uses the Aisin AS69RC electronically controlled six-speed automatic transmission. This transmission is specifically designed to handle the monstrous torque capabilities while still offering fast, smooth, and precise shift quality. The standard output Cummins 6.7-liter Turbo Diesel uses an upgraded 68RFE six-speed automatic transmission. Refined hydraulic control improved drive-to-park shift quality. Shifting from park to reverse was also improved thanks to a new reverse accumulator. Never before seen in a Ram HD the 6.4-liter HEMI V8 engine now comes mated to the smooth-shifting TorqueFlite 8HP75 eight-speed automatic transmission. For optimized fuel economy, performance, and drivability there are 40 individual shift maps. All of Ram's innovative engineering under the hood leads to the 2019 Heavy Duty being the most capable pickup truck. 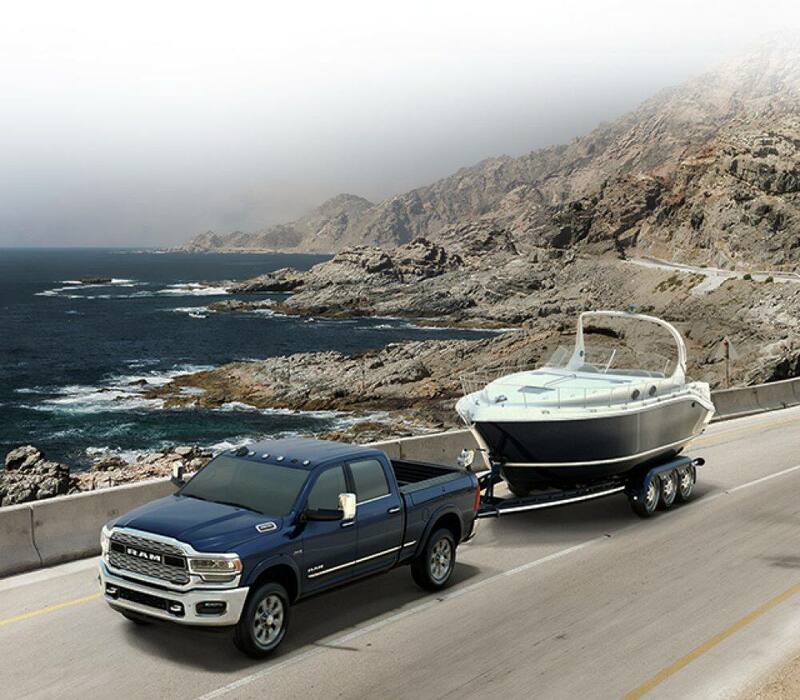 Tow a bigger trailer with a towing capacity up to 35,100 pounds and haul anything with a payload capacity up to 7,680 pounds. Hooking up even the heaviest trailers is now a piece of cake thanks to a new bed-lowering mode in the class-exclusive active-level rear air suspension. Hooking up gets even easier with the available 360 surround view camera with trailer reverse guidance view which provides an adjustable view of both sides of your truck and trailer. Other new features this year to the 2019 Ram HD include a new braking system with upgraded calipers, boosters, and master cylinder help shorten stopping distances. A new 98.5-percent high-strength steel frames offer greater capacities, reduced weight and the highest levels of torsional rigidity. Overall weight was reduced by 143 pounds thanks to lightweight materials in the frame, powertrain, and aluminum hood. Frequency response damping shocks, progressive springs, and re-engineered bushing improved overall ride quality. Shop our heavy-duty pickup trucks here or stop on by the dealership today to take one out on a test drive!